Olivia can't take it anymore. She's had enough of the big city and its lack of fulfilling her dreams. Then, just when she's about to give up and move home, out of the blue, she is offered her dream job. Olivia is suspicious but that could be just the New York in her. She decides not to pull at threads. Despite her best efforts to remain blissfully oblivious, the secret to her life upgrade is soon uncovered when she finds herself invited to be part of a secret society. An international upbringing and a love of stories laid the foundation for wanderlust. Shalini aspires to spend her time country-hopping and consuming pop-culture, comedy and good food but the reality is often frantically downing coffee, meeting deadlines at exactly the last second and working her unglamorous corporate job to fund all of the other pursuits. The Secret Lives of Royals is Shalini’s debut novel. Her other work includes published poetry and scripts only she has read. I'm just going to come out and say it: I was very disappointed in this book. 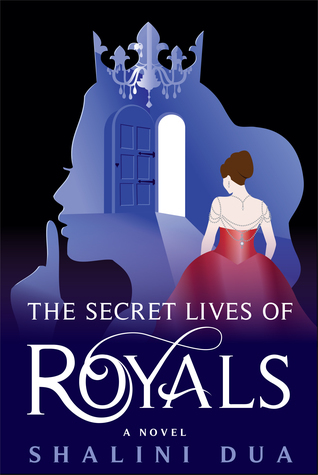 The Secret Lives of Royals is a mix of The Devil Wears Prada and The Princess Diaries. As a matter of fact, the first 100 pages reminded me so much of these two books, that I was beginning to wonder if Shalini Dua had an original thought at all. I only continued to read (and finally finish this 209 page book a week later! Who takes that long to read 200 pages?!) because I really wanted to know if she did have her own thoughts. She does, but when they were finally produced they were not executed nearly as well as the ones she borrowed from other writers. They were confusing, jumbled, and I felt like a fifth-grader was telling me a story. I actually had to double check the age range on this book, to make sure it was actually for an adult audience and to make sure I wasn't judging it too harshly if it was actually written for 12-year-olds (because that would have made more sense!) Sure enough, The Secret Lives of Royals is an adult women's fiction novel. I wasn't over doing my judgement. I believe that if you were to take out all of the drinking and meeting in bars (seriously, I think main character Olivia is an alcoholic), then this book would be great for tweens. However, The Secret Lives of Royals does not stand up to adult literature.